Guided Living Senior Home Care employs only experienced CNA/CHHA level caregivers and licensed RN and LPN professionals. Peace of mind for families is paramount, which is why we run a CORI report, drug screen, references check upon hire & a complete background check every month on all staff ongoing. Watch our 30 second video to see what makes care from Guided Living different from other agencies. Out of 5 quality categories, amount of responses ‘Met’ or ‘Exceeded’ expectations. It is hard to describe the panic triggered after a fall resulted in a fractured shoulder and humerus. A relatively healthy senior, suddenly I was unable to perform many activities of daily living and my independence was profoundly threatened. For help, I called Guided Living Senior Home Care and arranged daily assistance. Not only did they help with a variety of tasks, but their presence provided me with the opportunity to rest, an essential element to recovery. After several weeks, I gradually progressed. Today I can live independently, as I continue therapy to restore mobility. My progress was enhanced by the gentle and kind assistance of your CNAs. They were prompt and competent, always professional and respectful as we worked through the stresses of recovery. I doubt that I could have remained at home alone without them. Please extend my gratitude to your staff who served me. 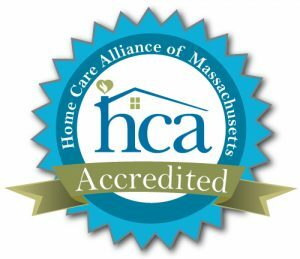 I am happy to share my experience with others and will continue to recommend your organization to seniors who find themselves in need of help at home. Good luck to you and the valuable services you provide. See example chronic illness specific care plan considerations here. Dedicated RN oversight of the plan of care & the caregiver team. Quality home care is not “task oriented,” but rather relationship based. Our nurses manage care to promote positive aging by monitoring good nutrition practices, safety at home, subtle changes in care & early response to those changes. Additionally, all caregivers undergo extensive background checks: MA State CORI, drug screen, & a monthly complete criminal background check. Caregiver to RN communications happen in real time using technology. This up to the minute information can be the difference between an unplanned event or an immediate intervention. Transparency of care is essential. Through our online family portals the clock-ins & clock-outs, scheduling, & daily care plans are available in real time. All online dashboards are provided to clients for no additional cost. Unmanaged chronic illnesses including Alzheimer’s Disease lead to more intense symptoms which can progress to loss of physical & cognitive function. This vicious cycle causes multiple problems such as fatigue, depression, pain, stress, fall risk issues, & medication mis-management. Our approach promotes & supports positive aging by monitoring good nutrition practices, safety at home, subtle changes & responding to those changes earlier in the disease cycle. Guided Living has been a life saver for my 91 year old father and our entire family following his brief stay at a nursing home after having a heart attack. We lost our mother the year before and myself and my siblings (some of whom live in other states) were worried about his continued recovery after he returned home. He would still need 24/7 care at home for a short while and we only had four days’ notice when the nursing home told us he was going to be released. I called Guided Living on Tuesday morning, met with them on Friday and a caregiver was at his house on Saturday when he came home! From my very first phone call to Guided Living we have experienced only warm and caring personal attention to our every need. All the staff are calm and pleasant whenever we talk and are always there for us no matter the time of day or how big or small our problem. It is like calling on a friend or loved one for help. We had a family meeting after 24/7 care was no longer necessary and decided to stay with Guided Living five days a week with a few hours of help in the morning and in the evening. The two CNA’s who help our father every week have become like family to us. We admire and trust them so much. They are very professional but so personal in their caregiving. We have such peace of mind knowing he is not alone all day and he likes knowing he has time to himself every afternoon. Two of us live close to my father and we treasure the time we spend helping him on the weekends. Our father always said as he got older that he never wanted to intrude on his children’s lives. As his children we feel very deeply that we want to be there for him in every way possible in this final chapter of his life. Guided Living has allowed all of us to be happy with the very custom care schedule they have set up. We are very grateful and wish the same for every family facing a situation similar to ours. Recently my family required support after the sudden illness and subsequent death of my father. The Guided Living team responded immediately, supporting my mother, an Alzheimer’s patient, during a very difficult time of transition. Every caregiver assigned to care for her was warm and attentive. The Guided Living office was professional and reliable with their scheduling, troubleshooting, and communication. Any question I had was answered immediately, and I was given full access to the Guided Living online Dashboard which allowed me to leave messages for the companion on duty, view the week’s schedule of caretakers, and see the tasks completed by each. My mother felt safe and comfortable. I will always be grateful that Guided Living was there for my family, and I highly recommend their care to other families in need. I am so pleased at how everything has worked out these last few months and now with a trip to the hospital and home again for my aunt and we want to pause for a moment to thank you and your team very much! My sister and I were just recently saying to one another how fortunate we and my aunt are to have you and your constant care and effort. It is so reassuring! We know this latest event must have been very scary for all involved – my aunt the most – and it is so great we can all celebrate a return home for her today. Please thank all of the caregivers and nurses!!!! Professional, knowledgeable, responsive and caring. Hands down over and above any and all expectations. Available at all times for all questions! I have been so impressed and grateful for the help and guidance through some very difficult times!! I am writing to thank you for the wonderful service you have provided for my parents. We greatly appreciate that you were able to provide customized care and rearrange schedules to meet my parents changing needs. We met you in a time of need for my family and you have offered support in every regard and allowed us to feel comfortable and confident that my folks needs were being met. You have gone above and beyond and we are deeply grateful. The initial referral came over a holiday weekend and still they could provide excellent coverage. Staff worked very well with the VNA case manager to alert us to problems. Office staff were friendly and helpful, and very responsive. All the caregivers assigned to my husband were wonderful. They brought a little sunshine into his last days and I am so grateful Patrick started this business. Your caregivers are terrific. They are professional, compassionate and genuinely concerned about their clients. Guided Living is a very reliable service that our family appreciates. They communicate well with the family and keep us informed of any situation that requires further or immediate intervention. If the nurse did not visit my mother while I was on vacation, she would most likely have died-alone and would have been found by a family member. Thanks to the nurse my mother was admitted to the hospital and had a good death-in comfort receiving medical care surrounded by her family. Amazingly dedicated staff. I will be forever grateful. The care, professionalism and observation skills of the HHAs are excellent. They are very quick to notice changes and problems. They are of great help. My parents would not have been able to live out their final weeks at home without the services provided. Great team of people. I have recommended you to a number of my patients, who have all been very pleased with the services. We are very happy with the nurse assigned. She provides exceptional care. My mother looks forward to her visits. We are also happy with the professionalism and courteousness of all the staff. We are extremely happy with my husband’s caregiver. She is very caring, reliable, and efficient in everything she does. You have a great team of people working for you. I cannot thank them enough for all their help with my father in law. Guided Living has given me peace of mind as I live 4 hours away from my parents. Everyone who has taken care of my mom has been wonderful. Thank you Patrick for having such excellent staff.